So Many Beautiful, Lovely Blogs – Travel. Garden. Eat. Having recently recalled my first impression after stepping off the plane in Paris, in this week’s response to the Weekly Photo Challenge, merci beaucoup seemed the appropriate response to words of appreciation from three of my fellow bloggers. While many view these informal blogging awards with some cynicism (or worse), I admit to having come round to routinely reading (and frequently enjoying) award posts by those bloggers I admire, because they have introduced me to some of my favorite blogs along the way! So, read on if you are so inclined, or move on to the next post or blog, if you are not . . . there’s something for everyone in this great, big blogging world of ours. Cafe Casey graciously nominated me for the “One Lovely Blog” award. I believe the post that introduced me to Cafe Casey is still one of my favorites — “Failing at Music, Succeeding at Life: Part Two” — although you can’t go wrong with any of her eclectic posts. Sometimes humor-filled, sometimes reflective, the diversity of her discussions is always enjoyable. 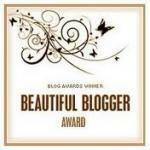 Prego and the Loon kindly nominated me for the “Beautiful Blogger” award! Prego and the Loon generously bares her soul and painful memories, as she moves forward from an abusive relationship. Her post, “Beauty and the Restraining Order” is powerful and moving. 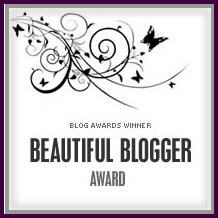 I was fortunate enough to receive a second nomination for the “Beautiful Blogger” award from the Nitty Gritty Dirt Man. I have to thank Kevin for filling the gardening void in my blog, given my lackluster efforts as summer waned! The Nitty Gritty Dirt Man is not strictly a gardening blog, though, for even some posts peripherally addressing tasks of the garden and yard leave the reader reflecting on so much more. Kevin’s recent post on raking, “Looking Up Before the Leaves Fall,” is a perfect example and a post I read with pleasure several times. 1. “Little Women” by Louisa May Alcott was one of my favorite childhood books that I still enjoyed re-reading as an adult. 2. Music moves me in a way words cannot explain. 3. I organized our spices in alphabetical order. My husband is the primary cook in the house; I’ll let you guess whether they are in alphabetical order now. 4. I am a “cottage garden” gardener, which means weeds are welcome if they bloom. 5. Planning and researching a trip is almost as enjoyable as the travel itself. 6. When I was a senior in high school, I was the drum majorette (sans baton) along with a fellow classmate as drum major for our high school marching band. The other three years, I marched with the snare drum. The Adventures of Tom and Atticus ~ If you are not familiar with the book “Following Atticus” it is a lovely read and vicarious tour of the White Mountains of New Hampshire, along with the endearing story of a man rediscovering himself through his relationship with his four-legged companion, Atticus. His Facebook page provides almost daily inspiration. Peri’s Spice Ladle ~ Peri’s blog is full of mouth-watering Indian recipes, cooking techniques, and Indian-inspired food tips. Whether familiar with Indian food, or exploring it as a new cuisine, you are sure to find something appealing in Peri’s blog. This Man’s Journey ~ The Island Traveler’s appreciation of life is infectious. He always leaves you with a feeling of gratitude. Stonehouse Photo ~ Hannah Stonehouse’s photo of John and Schoep in Lake Superior went viral, introducing her enthusiasm and passion for photography, particularly photography that includes our furry companions, especially dogs! Her blog reflects the joy she receives from her work. Mirth and Motivation ~ Elizabeth provides thoughtful reflections in her posts, with hand-selected quotes, and has been a sincere delight whenever we cross paths in the blogging world. Leaf and Twig ~ Photos with a nature theme paired with a perfect poem. Always a pleasure to see a new post! Perikles Merakos Blog ~ Perikles’ black and white images are particularly compelling, and his use of light makes for memorable photos whether in color or black and white. Where’s My Backpack? ~ Many of you may be familiar with this blog due to Ailsa’s weekly travel photo themes, but if you have not checked out some of her other posts, they are worth the read. A recent favorite of mine was her midnight drive along the Beartooth Highway. Ron Mayhew Photography ~ Ron’s cultural photography is a feast for the eyes, and you will enjoy many of his creative galleries. Belle Grove Plantation Bed and Breakfast ~ Follow the Darnells as they restore the birthplace of James Madison and open a bed and breakfast — an obvious labor of love. I frequently update my Blogroll and Links with many of my favorite travel, garden and eat resources and blogs, and there are still more waiting to be shared, waiting to be discovered! Enjoy and blog on, friends! I’d add to your list that you never miss the opportunity to “Pay it Forward”. You are one of the most thoughtful people I know, Kath! I had a similar experience watching “Marley and Me.” The first time I was listening to it an audio book in the car. At one point I had to pull over and park the car because I was crying so hard. So it’s not like I didn’t know what to expect during the movie, but that sure didn’t slow things down. It started with silent tears, but moved quickly to weeping, and then all the way to full-on shoulder heaving, gut-wrenching, no-way-to-keep it quiet sobbing. People actually turned and stared at me, and of course my children looked at me like I had suddenly grown two heads. I’m a dog lover, what can I say? Congratulations! You indeed having a blog that shares the most beautiful words and images. Thank you for sharing these awards. They made me smile with joy . Have a great week.